Start SpeedFan when your PC boots and keep it running 24x7 in the background. No need to log on! 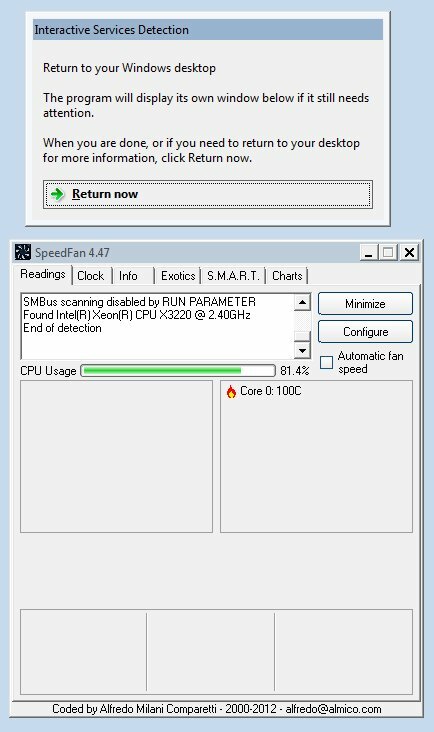 SpeedFan is a free utility that monitors voltages, fan speeds and temperatures on computers with hardware monitor chips. Download and install SpeedFan, if necessary. In the Arguments field, enter /NOSMBSCAN. 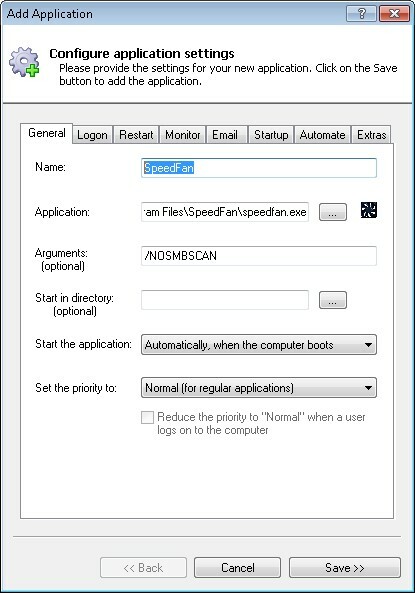 This prevented SpeedFan from scanning the SMBus and hanging when it started on our PC, so we recommend it for you too. Feel free to add any other of SpeedFan's command line parameters here as you see fit. In the Name field, enter the name that you will call the application in AlwaysUp. We have specified SpeedFan but you can specify another name if you like. Click the Save >> button. In a couple of seconds, an application called SpeedFan will show up in the AlwaysUp window. It is not yet running though. That's it! Next time your computer boots, SpeedFan will start up immediately, without anyone needing to log on. Please restart your PC now and test that SpeedFan works as expected after Windows comes back to life. And please feel free to edit SpeedFan in AlwaysUp to check out the many other settings that may be appropriate for your environment. For example, send email alerts if it stops, boost SpeedFan's priority, etc. SpeedFan not working properly as a Windows Service? From AlwaysUp, select Application > Report Activity > Today... to bring up a HTML report detailing the interaction between AlwaysUp and SpeedFan. The AlwaysUp Event Log Messages page explains the more obscure messages.